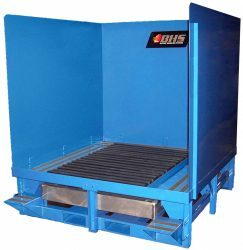 The Mobile Hardwood Wash Station (MWS-72) is the ideal solution for washing forklift batteries in Gantry Crane systems or other vertical-extraction applications. It includes base-mounted fork pockets for ease of travel. The frame is made from heavy-duty steel, then powder-coated to resist corrosion, rust, and abrasion. The MWS-72 features a recycled polyethylene decking that is acid-resistant, non-conductive, and environmentally friendly. Non-skid steps and a 15-inch walkway provide easy access for workers, and a removable drain tray makes cleaning forklift batteries of virtually any size simple. Mobile Wash Stations provide multiple benefits to end-users and dealers alike. Heightened mobility allows users to build flexible, modular battery rooms. Dealerswho offer washing services can bring a Mobile Wash Station to the client’s facility; this allows them to drastically reduce downtime, generating more value for their customers. Dual anchor points secure the unit during travel. For permanent installations, secure the unit to battery room floor. To learn more about how the MWS-72 can simplify battery maintenance, call the BHS sales team at 1.800.BHS.9500.